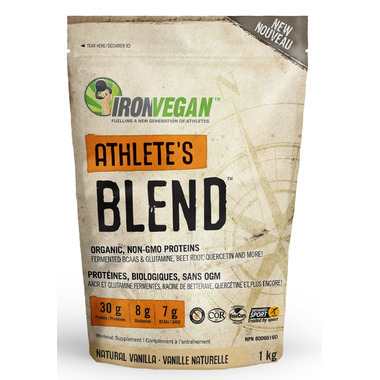 IronVegan Athlete's Blend takes the performance benefits of Sprouted Protein to a new level. An all natural formula that is certified vegan, kosher and gluten free and made up of organic, non-GMO proteins. It has also been designed to aggressively support the needs of the most ambitious athlete. then this formula is for you. A remarkably smooth and creamy taste! 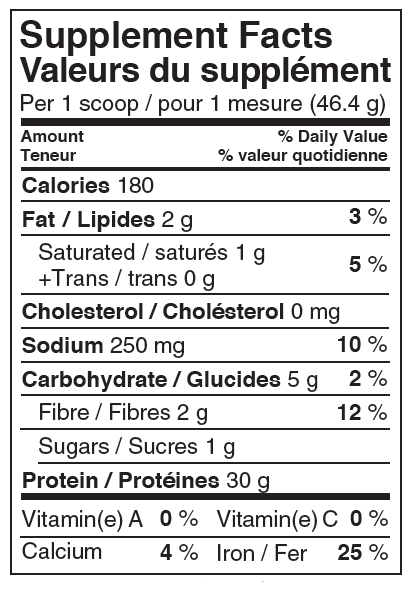 Non-Medicinal Ingredients: Organic Vanilla Flavours, Apple Pectin, Xanthan Gum, Organic Stevia Leaf Extract, Sea Salt. This is the best tasting brand of vegan protein. Great for using in pancake, cookie, and smoothie recipes. Been a loyal user for 6 months now. Highly recommend. Love this product! The taste is amazing and I find it very easy to digest. Highly recommended to all athletes out there! I divide a full scoop between two smoothies which works great! This is the best plant-based protein I have ever tried... Although it is a little pricey, I think its worth it for the quality and taste this product provides. Blends well and has a lot of great components! Love this product, excellent flavour for vegan protein. It has been a struggle to find one that tastes good, and isnâ€™t to sweet ex. I also really like that it is fermented, so it doesnâ€™t cause bloating/ gas like some pea protein can for me. I am only giving it 4 stars because their is few types of seaweed in it, and I am try to avoid eating anything from the Pacific Ocean due to radiation concerns. So it is worth noting that their may be pacific based seaweed in this product. This product is excellent. Smooth, creamy, great texture and flavour. Thank you Well.ca for quick and fast shipping and delivery and unsurpassed customer service!